Nope. Sorry bro. Read the boards a little more and you'll find out that Mazda integrated the A/C controls into the factory headunit. So in addition to the piece of plastic, there is a small amount of conversation electronics to trick the car into thinking the factory headunit is still installed. On this note, a group buy for the Corksport kit is going to be placed on Feb 8th. 15% off for anyone that buys within our 24-hour window. I've been waiting a year for this, so it's not getting any cheaper. Check out the Corksport group buy thread in this section and hop on board! Last edited by firebirdude; 02-03-2008 at 08:43 AM. i take it theres not, was reading up on another forum for people trying to get a group together to get a group discount, i would be in but its still not worth paying that kind of money for a piece of plastic, anyone think of taking there stock plastic off and having someone custom make one? like out of fiber glass? I know very little about harnesses, pin-outs, etc, but I stumbled across this today looking for a Metra for my DVD install. If no one's heard of it, I'll order it and post up feedback on how it works out. Hmmm. It may plug right in, but you're going to lose your A/C controls. (Even if you could fab your own dash kit) Also, this isn't going to work if you have the Bose system. You'd be sending an amplified signal to an amplifier. This leads to popping and extremely loud audio on low volume settings. Last edited by firebirdude; 02-27-2008 at 10:32 AM. The Bose issue was going to be my concern as well. Do you guys think if I have "premium audio" listed in my accessories installed, that means my stereo is BOSE? the front doors have "bose" written on the tweeters. Tap the fuse for remote wire!!! I've been having problems with this forum and not being able to find out some proper info. All of the info on this post says that the remote wire should be connected to the center console lighter. Well for some reason my rx8 doesn't have one. So every other post I could find stated that I need to read the damn sticky and refer to this page. Well I guess I was able to figure out something on my own. I just ran the remote wire to the drivers side fuse box and connected it to a fuse tap that I attached to the Ciggy fuse. Good stuff! It works great! So for those out there in my same newbie position, try a fuse tap. They were a buck 99 at radio shack! Look again nizzy. All 8's have em'. Man, We Ain't Found Sh*t! great thread! thanks for the info! I promise you that I dont. Under my HU there is one but that's it. Where there should be one in the arm rest there is nothing. I have a little plastic door that can be slid off where a lighter should be, but upon removal there is just a hole. But my fuse tap solution worked fine so no biggy. Just a hole? As in.... no cig lighter, but there it still a socket? Or a hole in the plastic and you can see the body of your car? I think I know what nizzy is confused about. The hole you can see or the plastic cap is with the cup holders that looks into the area of the e-brake. That's not where the lighter is. When you slide the arm rest back and see the cup holder, you can then lift the arm rest up and see another compartment with the lighter plug in it. Let me know if you found it. Also, I use a bazooka powered sub, which detects sound to switch on, so I never had to wire a remote wire into the lighter unit. Remote turn on for bose amp? is there a remote wire for the bose amp? im tapping into the rear amp wires and i wanted to know if there is a remote wire that i also need to tap into? Hey guys has anyone found a replacement dash kit for a aftermarket head unit? Or any info would be cool. Cant find nothing around my area. But your answer is in the very first post in this thread. Look under "aftermarket headunit". They're trying to do a group buy for a discount..... but you're still looking at like $400. No problems when it's mounted there. I've had my system cranked for over an hour in the Florida summer without issues. However, I used to have it on the BACK of that box. Between the box and the rear seats. Played great most of the time. But during those long road trips (45+ minutes) it would kick into thermal protection for 15-20 minutes. 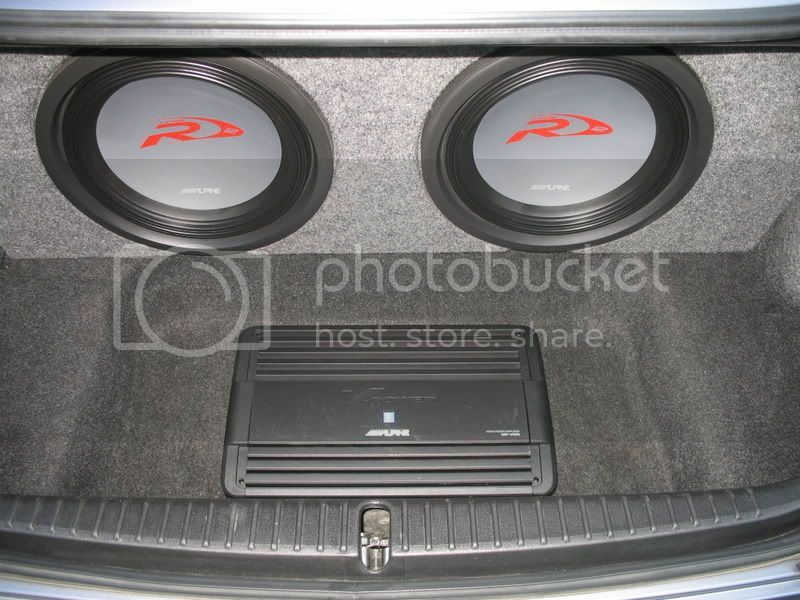 I am installing a couple subs without replacing the head unit...any suggestions how to wire it to get the best sound? Last edited by Aj_89; 06-22-2008 at 05:00 PM. Did you even read the first few posts in this thread!?!? I like the sound - I would do a few things differently: The alpines and the phoenix gold's are ok, but I'd try something different. I also hardwired a sirius radio in with the adapter (can't think of the name right now) - sirius sounds good, but it's still not as good as cd - somewhat disappointed in the sound quality of sirius even when it's hardwired in.